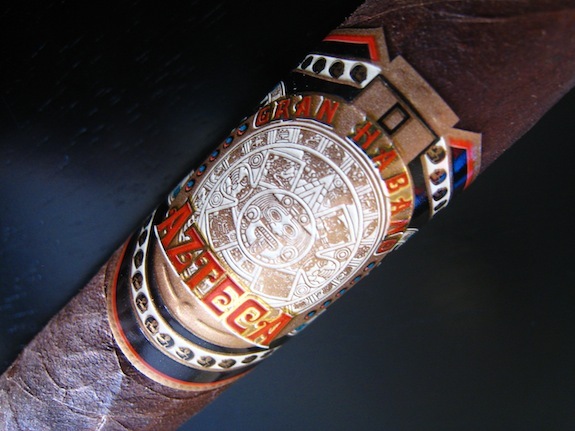 Recently I had the pleasure of trying a few pre-IPCPR samples of Gran Habano’s newest creation, the Azteca. These sample sticks were sent to me courtesy of Gran Habano a week or so prior to IPCPR. Many of you may know there were a few things going on that really set me back on my review line up, but alas I am back on track and finally getting around to reviewing this cigar. 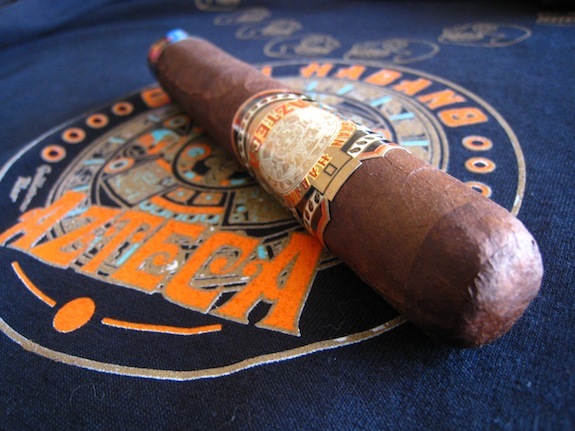 The Good Stuff: The Azteca sits in its own little corner as the newest, and most different cigar of Gran Habano’s line. The Azteca is a double maduro composed of a Mexico Maduro wrapper and binder grown in San Andreas encasing filler tobacco grown in Nicaragua and Panama. According to our friend Barry over at acigarsmoker.com (Check him out if you haven’t hear of him, great guy), “the first release of the Azteca has been aging since August, 2009”. This is a full body cigar and what seems to be a possible turning point for Gran Habano’s current portfolio. If I’m not mistaken, recently Gran Habano actually announced that they were going to be haulting the production of two of thier lines, the 3 SLS and the Cabinet Selection in order to put more attention to the Azteca Line. 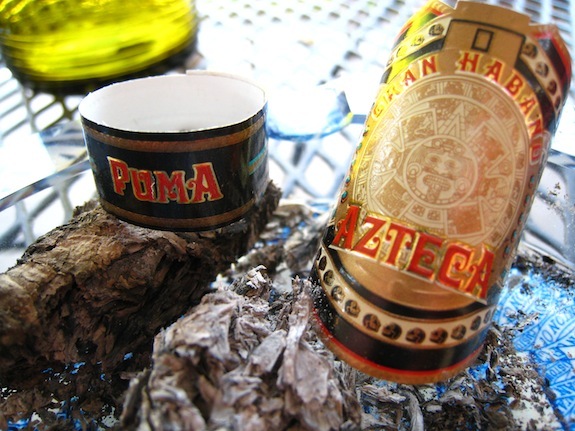 Prelight: The Gran Habano Azteca Puma is a very thick and heavy cigar. I could probably knock someone out with this thing. It’s very firm to the touch and incredibly hard. 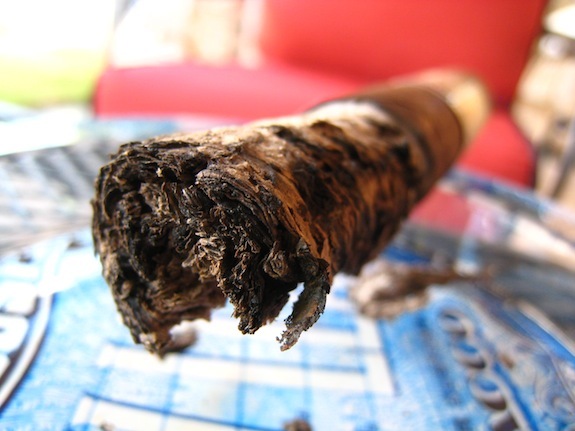 The wrapper is very silky, and tough with very large veins running the entire length of the cigar. 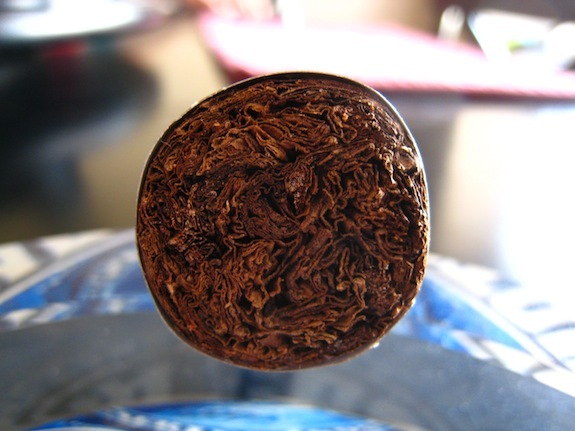 The wrapper itself is a deep, dark chocolately brown leading up to a seamlessly round cap. The band makes a huge statement sporting a large, brown Aztec calendar surrounded by orange and gold inlayed titling of the brand “Gran Habano” as well as the bold cigar name “Azteca”. The back of the band has a small light brown and teal crest and the Brand Owner’s names “George and Guillermo Rico”. The band that surrounds the foot is a simple dark brown band with gold and teal bands as well as a gold and orange inlayed name of the vitola, in this case the “Puma”. These are incredibly detailed and beautiful bands. 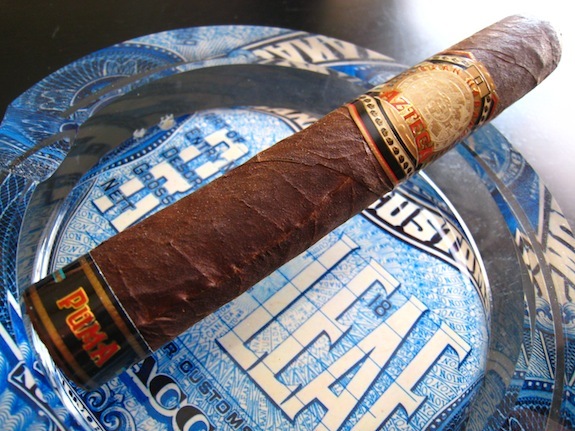 The wrapper of the Gran Habano Azteca doesn’t give off much more than a faint tobacco smell, where as the foot boasts of tobacco, cocoa, and earthy aromas. The Azteca cut very clean using my double bladed Palio cutter. The cold draw is VERY interesting. The first puff exclaims of a rich, more natural tobacco flavor teased with a very spicy, and earthy undertone with just a dash of cocoa. First Smoke: The Gran Habano Azteca is a very differently tasting cigar. At least, in comparison to what I am used to. The initial flavors are jam packed with a very sweet, light, natural tobacco taste backed by soft spice, and bittersweet chocolate. The draw is remarkable. Each small puff produces a massive amount of thick, grey smoke. The Azteca give off quite a bit of earthy and enticing wood scented stationary smoke. The burn line started off slightly wavy, but corrected itself about a half inch into the cigar. I blame my single flame lighting technique on this larger ring gauged cigar. 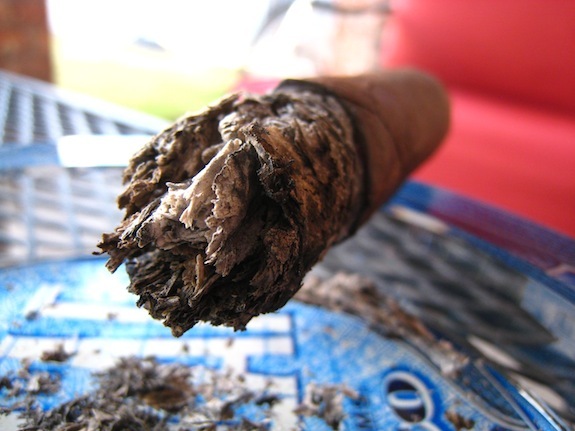 The ash left behind is a compacted, darker grey with black spots and just a few flakes here and there, mostly towards the foot of the cigar. As I got about an inch into the cigar the ash on the foot flowered and actually “bloomed” open. This is common and didn’t hinder the experience in anyway, it’s just always interesting when you run into it. As a side note, this only happend to this sample, not the previous one I smoked. After the main “pedal” fell form the ash, The ash carried on and still held on for almost two inches before giving way. Halfway There: Two thirds into this Gran Habano Azteca, I started to get a really, deep, and pleasant spiced woodsy flavor. This was followed up by the creamy cocoa, and sweet natural tobacco flavors. At this point this cigar has been smooth all the way though with no signs of nicotine. The retrohale is a bit spicy (not peppery) but gives your nasal passage a great little woodsy priming. The burnline tends to do its own thing every now and then, but always seems to correct itself before my lighter intervenes. I have yet to really feel any nictotine from this cigar. Finish: To my surprise the massive band on this Gran Habano Azteca slid off with extreme ease. Up until the final third I haven’t felt much, if any nicotine buzz from this cigar but that has change up a bit. The body has definitely ramped up a bit. I’m not feeling a whole lot, but it’s there for sure. The cigar has remained incredibly smooth all the way though. There was no harshness built up towards the end and the final flavors were that of cocoa, wood, and again, that sweet spice. The flavors didn’t change up too much, the but the complexity and deepness were very satisfying and enjoyable. The burnline gave me no problems in the final stretch. All in all it took me about 1.75 hours to take down the Gran Habano Azteca Puma, and I enjoyed every minute of it. Oerview: Gran Habano is in the process of actually haulting manufacturing of a few of their lines in order to pay more attention to the Azteca. That being said, a lot of work has, and is currently being put into this blend and it shows. The Azteca is more an old school maduro producing great cocoa, woodsy, and earthy flavors with a smooth and balanced body. The 60 ring gauge was a bit large and uncomfortable to me (usually I enjoy larger vitolas but over the past few months I’ve been drawn to coronas). I really think the double maduro wrapper and binder would shine through with even more flavor on the smaller sizes of the Azteca. All in all I think the complexity makes for an excellent cigar not only for long time cigar smokers, but the flavors paired with the smoothness will satisfy beginners as well. At a price point of around $6 – $8 I think the Gran Habano Aztec will be finding it’s way into my regular rotation very soon. Pairing: Having the Azteca before, and being quite aware of its smooth, creamy, chocolate upbringing I decided to pair it with another one of my favorite beers. St. Peter’s Cream Stout. St. Peter’s Cream Stout is a 6.5%, sweet, milk stout brewed a the St. Peter’s Brewery in Suffolk U.K. This cigar is a great pairing with most sweet tobacco, or maduro cigars. The creamyness helps smooth out the experience while the sweet chocolate undertones only enhance a cigar’s flavor. 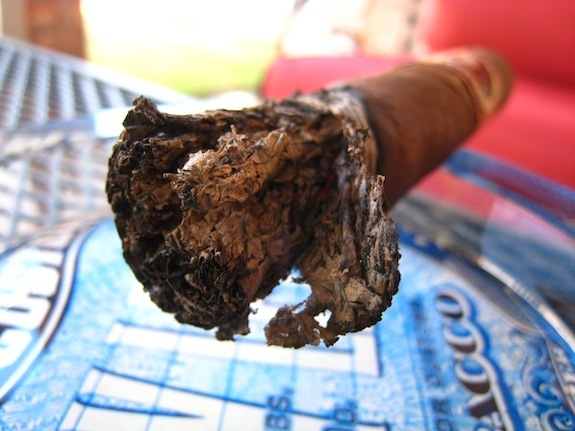 Black coffee, Brown Soda, Water, or a rich Port would pair perfectly with this cigar. Great review Tony ! Does Bonita or Tobacco Road carry this brand? It sound like something worth trying, or even just having around for the Raza to enjoy. hahah! The Raza! NICE! I think Bonita does, Tobacco Rd. does not. He has a few of Gran Habanos other blends though! I’ll keep ya updated. Great review. This sounds and looks like an awesome cigar. I really like that band. Like Albert said, at least to have it around for the Raza to enjoy. It really is a great cigar at that price. Something a bit more traditional. A very welcomed change-up from the norm. I tried this cigar last week and I didn’t care for it but i may give it another go soon. Great review!! Thanks Champ! What size did you have? I would love to try it in a smaller size. 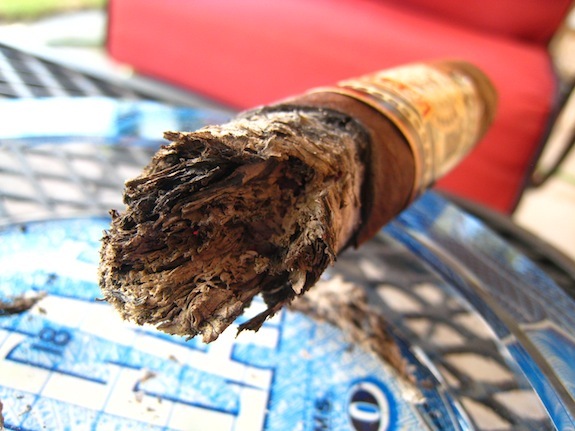 I tried a Gran Habano Azteca Jaguar (6″ x 54) and found it to be a nice smoke.